I love to paint on many different kind of surfaces. One of my favorite surfaces in a plain old coffee can. These metal cans will probably become a thing of the past since they are being replaced with plastic (boo hoo). I make wooden tops for them. They make good containers for just about anything, especially cookies. This cute snowman was designed by Terrye French. It is from her painting book “Winter Holly and Christmas Jolly” published in 2000. Unlike me, some things never seem to grow old. Would love to hear from you about your painting experiences and your favorite patterns that never seem to grow old. 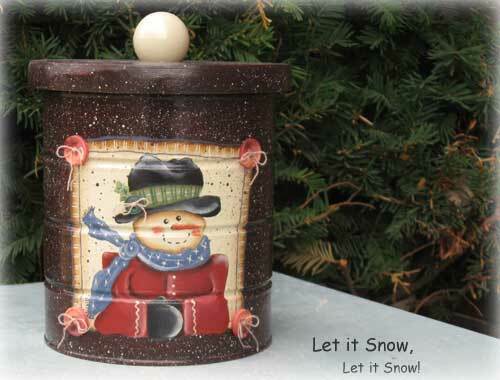 This entry was posted in Misc painted crafts and tagged country crafts, crafts, hand painted, painted coffee can, snowman, winter crafts, winter holly on Thursday, March 8, 2012 by Betty.